David M. Cannell & Associates are able to draw on not only in-house research and development in designing new vessels, but also on knowledge of the performance and maintenance of vessels over extended periods of use, gained over many years surveying commercial vessels. This ultimately leads to a design which not only meets the client's speed, powering and seakeeping requirements, but to a vessel which is more reliable mechanically and structurally throughout its lifespan, with least maintenance cost and time out of service. We can undertake new designs from scratch, developing a bespoke solution from concept to production. Alternatively we can use our library of existing designs, customising as necessary to achieve the required specification but saving time and money compared to a bespoke design. Clients include Defence Ministries, Pilotage and Harbour Authorities and Coastguards, Fisheries Protection and offshore installation support companies. Our portfolio includes vessels as diverse as a 60m Pirate Galleon used as a film set, fast patrol vessels and pilot boats and a disabled access cruise vessel. A selection are described below. Following a world wide survey of designs, Bollinger Shipyards Inc. selected David M. Cannell & Associates to produce a new design based on a proven hull shape which would meet the US Coastguard’s highly detailed specification for procurement of a new class of 26 metre Coastal Patrol Vessels. 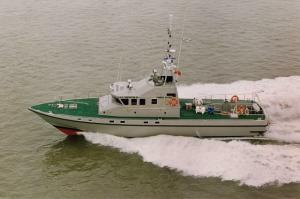 David M. Cannell & Associates were able to complete the design in the short time scale available, meeting all requirements of the specification and incorporating in the vessel the firm's copyright daughter vessel launch ramp arrangement designed for the UK Fisheries Protection Vessel, ESF Protector III. The proposal by Bollinger's won the contract against intense competition (at the time it was the largest small boat contract in the world). 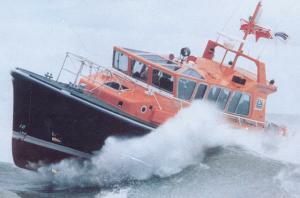 The first vessel was constructed in 1997 and since that time, over 80 vessels of the class have been built. The copyright stern launch and recovery system developed by DMC&A allows the RIB to be launched in a matter of seconds in sea conditions up to Sea State 5 and recovered simply and safely in the same conditions without recourse to conventional and hazardous davit or crane operations. 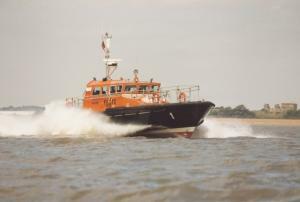 David M. Cannell & Associates have been designing fast patrol vessels and work boats for over thirty years and our designs are in operation world wide with a variety of organisations national authorities. Our designs are characterised by exceptional load carrying ability and low power requirements together with excellent sea keeping qualities. As just two examples, the UK Sea Fisheries Authority, Eastern Sea Fisheries Joint Committee commissioned "ESF Protector III", a 23.5 metre twin screw patrol vessel with controllable pitch propellers and a 6.7m RIB daughter vessel which is ramp launched and recovered. "Protector III" is constructed in GRP and powered by twin Caterpillar 3412's is capable of up to 30 knots (subject to displacement). 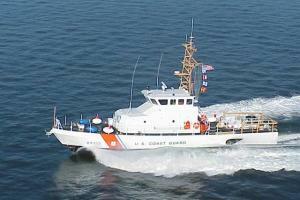 "Protector III" was launched in 1994 and has since proved extremely effective in her role. The crew report they seldom make passages at less than 20 knots, whatever weather conditions. Following budget cuts, “Protector III” was recently sold to the Gibraltar Police Authority, who are delighted with the performance and seakeeping of the vessel, almost 20 years after her launch. "Protector III"'s tank tested hull design has sisters ranging from 21 to 30m in length, constructed in either FRP/GRP, aluminium alloy or steel. 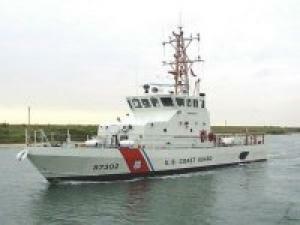 The 16 metre patrol boats pictured are operated by police and military forces in the Caribbean and Middle East. Capable of speeds over 35 knots, these vessels can be powered by either twin screw or twin water jets and again, can be built in GRP or aluminium alloy. This vessel is designed for multi-activity holidays with luxury accommodation provided for 12 guests and eight crew, with full disabled access throughout. The vessel incorporates a lifting stern platform to allow easy access to the water and to tenders, kayaks and sailing dinghies. 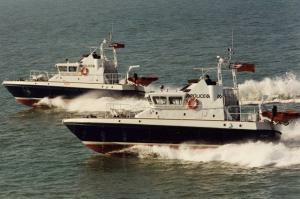 DMC&A has been involved with Pilotage Authorities for many years, both designing vessels and as retained Consultant Naval Architects/Surveyors. The photograph shows the "St Nicholas", a 14.5 metre twin screw pilot launch, one of four operated by UK Pilotage Authorities to the "FRCV" (Fast Round Chine Vessel) (Link to FRCV page) design of DMC&A. 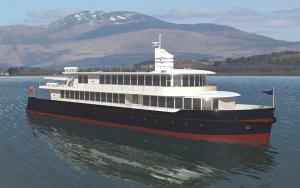 The vessels are powered by twin 530hp turbodiesels and achieve speeds of up to 27 knots. A 16m variant on this design has been tank tested for waterjet propulsion at higher speeds. Fendering developed especially for this class ensures that minimal damage is suffered during the "controlled collisions" which characterise pilot boarding operations. This vessel, at the time of launch, was the most expensive film "prop" in the world. She was designed by David M. Cannell & Associates and constructed for Carthago Films for the Roman Polanski film "Pirates". The vessel was built in Malta and towed to Tunisia for fitout and is based on a steel sub-hull with diesel powered multi-directional thrusters. DMC&A both undertook design work for the project and oversaw the build in Malta and Tunisia. 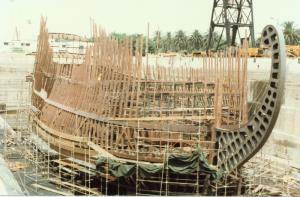 The vessel is, in actual fact, much larger than a typical galleon of the period at over 60m. All the rigging and sails are operational. Neptune proved extremely successful and can now be seen moored in Genoa, Italy as a tourist attraction.